Single-element probes are widely used as they can interface to many materials and geometries, but are not well-suited to area coverage. C-scans, using position sensors, ensure 100% coverage but scan time and operator costs are still large. Mechanically-scanned jigs are faster but inflexible and expensive. Electronically-scanned ultrasonic arrays offer the potential to solve these problems but the costs of customizing for material interfaces has limited their uptake. Integrated arrays were developed on a BRITE-EURAM project and inspection speeds significantly greater than the target of 400% were achieved. The arrays can be used with conventional flaw detectors, so requiring minimal additional operator training, but a real-time imager is needed to realise their full potential. A number of papers have been presented over the last few years which have described individual parts of the development. This aim of this paper is to bring together much of this background information and to present new results. The architecture of the family of integrated arrays and of the laptop-based acquisition and imaging system are described. The capabilities for real-time B-scanning and for mapping, where the array's position sensors produce a C-scan from a single wipe across the surface, are discussed. Some results from typical applications are presented. Speeding up an ultrasonic inspection is highly desirable as the inspector's time represents a significant proportion of the cost and this becomes even more critical if equipment has to be shutdown or taken off-line during inspection. Manual inspection with single-element probes is widely used because it can adapt to the great range of materials and geometries encountered. The probes inspect at a point on the surface and so are not well-suited to area coverage, which is time-consuming and hence costly. Automated mechanical scanning can increase inspection speed but this is complex, costly and inflexible. Electronically-scanned arrays can achieve rapid area coverage without these constraints. They have been widely used in the medical field but have not made a successful transition into NDT because of the costs associated with customizing the array for the different target materials and surface geometries. Diagnostic Sonar Ltd. (DSL) has been using electronic arrays for 25 years in both medical and industrial real-time imaging systems. This experience has been exploited, in a European-funded BRITE-EURAM project (RAPINSPECT) to reduce weld inspection time and hence cost by using a novel design of integrated array. Experience has shown that the array techniques would take a long time to achieve widespread acceptance unless they make extensive use of existing flaw detection equipment, techniques and operator skills. The arrays developed, for weld inspection and other applications, can indeed be used with conventional equipment and skills, although the relationship between acquisition and display update on some digital flaw detectors may make them unsuitable for some applications. However, the best results are obtained when the array is operated with a data acquisition system which is capable of real-time imaging. This paper discusses the requirements of such a system and the architecture adopted to implement it. The paper starts by reviewing the benefits of arrays for rapid manual inspection and outlines the way in which they are used with conventional ultrasonic equipment and their constraints. This is followed by a summary of the special requirements of the data acquisition and imaging system and the implementation is discussed with examples. Conventional single-element disk transducers are widely used with flaw detectors for detection and classification of flaws in many materials. It is difficult for the operator to scan a narrow beam transducer in a way that ensures 100% coverage whilst still concentrating on the flaw detector display. A mapping technique can highlight missed regions but whilst this increases the confidence in the quality of the inspection, it is still slow when an area has to be covered. The beam size could be increased, for example by using a paintbrush probe, to ensure beam overlap on adjacent scan lines even with manual control, but this degrades the sensitivity to small flaws and the ability to localise them. An alternative is to use a mechanical jig to constrain the probe to follow a path with overlapping beams. If motorised, it can give a considerable speed-up of the inspection but is expensive to implement and as a result is largely confined to the production environment where large numbers of low value components, or small numbers of high value components, are to be inspected. Electronically-scanned arrays were introduced into medicine in the 1970s, primarily to show movement but also to speed up the scanning of a volume. Progressive improvements were made in signal processing, such as swept focusing so that all points in the image are in focus, and the results eventually exceeded the performance of the single disk probes. The combination of better performance and reducing costs, from the rapidly expanding market, have made the array dominant in this field. 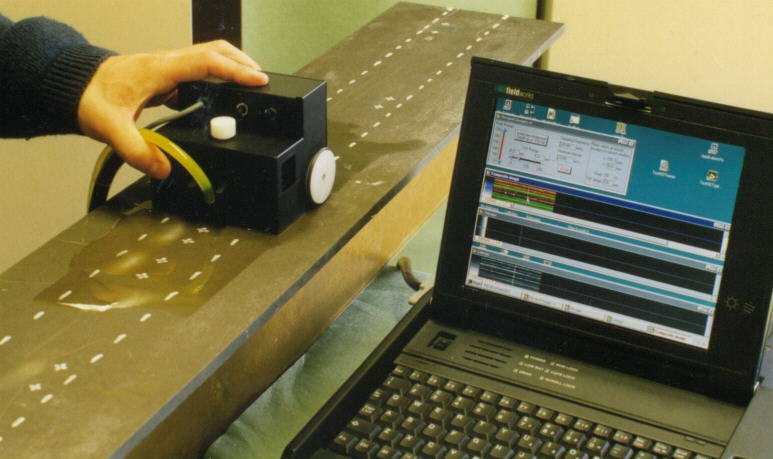 Attempts have been made to adapt this technology for NDT (Krautkramer & Krautkramer 1983, Willsher & Smith 1998) but as yet it has only found favour in niche applications which require beam steering, or where the need for rapid manual scanning of large areas can justify the expense of customized equipment and operator training. DSL's part of the RAPINSPECT program was to investigate array techniques for speeding up inspection, aiming for a 400% increase, so allowing inspection costs to be reduced. DSL has used arrays in NDT for real-time B-scanning systems, such as the DSL108 and Flaw Imager, which were used for inspecting Carbon Fibre Composite (CFC) wings. Experiences with diversifying these instruments to other applications confirmed that industry acceptance of array techniques would be limited unless arrays could be made to work with as much existing equipment and operator skills as possible. Most probes in transducer suppliers catalogues are manufactured from piezo-ceramics and these materials have to be diced up with precision saws when fabricating arrays to control spurious vibration modes (Bennett 1995). It is the cost of these operations, combined with the vast range of probes that make them expensive, especially when they have to be mated with a multi-channel control system. Piezo-electric polymers are highly damped materials and so dicing can be replaced by low cost photographic transfer techniques to define electrode patterns. They are not efficient materials for transmission and have a large acoustic mismatch with the target materials for weld inspection and so will be less sensitive than piezo-ceramic alternatives (Bennett 1995, Reynolds & Hayward 1998). It was felt that the low cost of customization outweighed these disadvantages as long as an adequate signal-to-noise ratio (SNR) was achievable, and establishing this was an important early goal of the project. 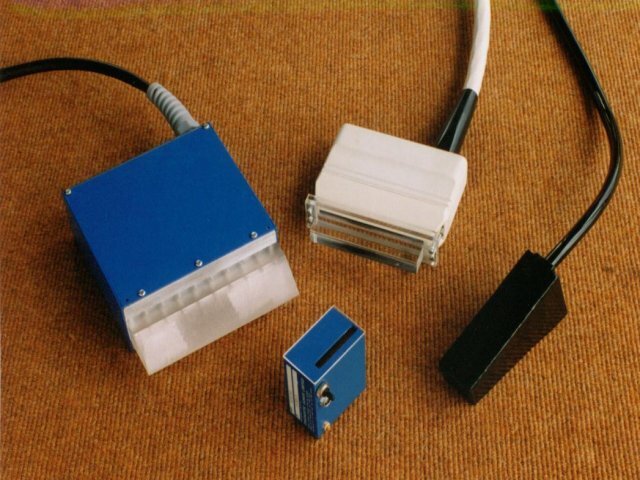 The broadband capability of the damped piezo-polymer would allow the same probe to be used to cover a wide range of applications and frequencies. Piezo-polymers have a significantly lower electrical capacitance than their piezo-ceramic counter-parts and require pulser-receiver circuitry mounted close to the elements to minimise losses and ensure adequate element-to-element uniformity. This requirement can be turned to an advantage by integrating the whole array controller system (comprising controller interface, sequencers, multiplexers, pulser-receivers and beamformers) all in the same housing, so helping to satisfy the goal of simple integration to existing equipment, such as flaw detectors. 1-3 piezo-composites are now becoming more widely available, especially for the lower NDT frequencies, and they can offer improved sensitivity and bandwidth compared to piezo-ceramic transducers. However, their suppression of lateral vibration modes means they can use the same low cost techniques for customisation of the element patterns. These materials can therefore be used in the integrated ultrasonic array where the ultimate in performance is required. The design of the integrated ultrasonic array as used for weld inspection has already been described (Lines 1998). The key features are reviewed again here, to provide the necessary background for the discussion of the imaging system. Additional features, for use in other inspection applications, are also covered. DSL has also produced a low-cost electronic multiplexer, for use with piezo-ceramic and piezo-composite arrays where the capacitance is high enough not to need the individual pulser-receivers. These use a similar interface to the RAPINSPECT piezo-polymer arrays and so all can be used with the real-time imaging system described here. There are a number of ways that arrays can be used to speed-up the inspection. First however, it is useful to clarify the scanning mechanisms. The simplest method for scanning an array is by grouping a number of adjacent elements together and treating as though this was a single transducer, as in Figure 1a. The beam produced by the sum of the contributions from each element is centred on this active aperture. The beam is scanned by stepping the active aperture along the length of the array. Figure 1b shows how the multiplexer can be replaced by a beamformer, which is able to insert a different delay for each element in the aperture and by this means is able to focus the beam. The focal position can be varied by altering the magnitudes of the delay and, in medical systems, the receive aperture and focus position are swept to track the position of the transmit pulse as it propagates through the body. It was this dynamic focus capability, with the ability to maintain a tight focus at all depths, that eventually ensured that the simpler mechanically-scanned single-element probes were replaced by arrays for medical imaging. Figure 1c shows how the delays can be further modified so as to steer the beam at an angle. Each element must be sensitive in the direction of the whole beam and this places significant constraints on maximum element size. Consequently there have to be a large number of elements to make up the same aperture size and the resulting unit is more complex and expensive. The scanning action can be done by using the whole array as the active aperture and then sweeping the beam angle. This configuration is often known as a phased array. The alternative is to step the active aperture along the array as for the focused step-scanned array case. Some of the options for the specific application of weld inspection are now outlined. 3.1 Configurations for weld inspection. Figure 2a shows the arrangement for inspecting the volume of a weld with a conventional angled shear wave probe according to the inspection standard BSEN1714:1998 Non Destructive Examination of Welds - Ultrasonic Examination of Welded Joints. The weld cross-section is examined by the movement of the probe towards and away from the weld line and this section is then stepped progressively along the weld length - the probe therefore following a fine raster scan to ensure all regions are covered. As the distance between probe and weld changes, so too does the place on the A-scan trace which corresponds to the weld. The operator's skill, hand-eye co-ordination and experience are crucial to obtaining 100% coverage. This method is slow and attempts have been proposed (Ginzel 2000) to speed it up when the inspection with a single element probe is automated. The scan distance parallel to the weld is usually much greater than that perpendicular to the weld and so the number of motor reversals, which take up a significant time, is minimised by doing a sequence of scans parallel to the weld. The automated scanning arrangement ensures 100% coverage but it still takes a considerable time and so other approaches such as the Time-of-Flight Diffraction (TOFD) technique have been proposed. This uses a pair of probes mounted in a pitch-catch arrangement on either side of the weld. The transducers have divergent beams to inspect the whole weld cross-section and so just require a single scan parallel to the weld to do 100% inspection. However, the divergent beams and the fact that the flaws are detected by diffraction from the tips of the flaw both contribute towards reducing the signal strength. This technique therefore requires an excellent signal-to-noise ratio as well as imaging equipment to capture and display the signals for analysis. Figure 2b shows how the conventional weld scan technique is extended for larger (paintbrush) probes and so is equally valid for arrays. This configuration is referred to as a longitudinally-scanned array since the beam is sequenced along the axis parallel to the weld axis. The width of the cross-section covered on each raster scan-line is now much wider and so a coarser step is possible. This not only makes for a faster inspection, but also greatly simplifies the task of ensuring overlapping scans and hence 100% coverage. The array is able to maintain (or even improve on) the small beam size of the conventional probe and so avoids the paintbrush probe's drop in sensitivity to small flaws. The array must sweep the beam sufficiently fast so that there is negligible probe movement within the time taken for the scan to cycle round the full sequence of beam positions (the array's frame period), but this is relatively easy to achieve with electronic scanning. Even in the cases where a low pulse repetition frequency is needed to avoid repeat echoes in low attenuation media, arrays can make use of special beam sequences (interlacing) to maintain relatively high overall frame rates. Since this approach is simply an extension of the conventional method, it will work with existing flaw detector equipment and there is minimal additional training required. Localisation and characterisation of any defect found can be done by stopping the beam sequencing and then using the same techniques as for a conventional probe. The pass/fail decision is made on the basis of the A-scan display, rather than monitoring by gates, so it is essential that every beam be represented by a trace. This constraint can be a problem for some digital flaw detectors and the implications of this are discussed in more detail later. Figure 2c shows the arrangement if the array is rotated through 90° and mounted on a wedge to achieve the angled shear wave. There are several advantages with this transverse-scanned angled array approach. The electronic scan is now through the weld cross-section and so can be shown as a real-time B-scan, significantly improving the search speed as well as making use of the human visual system's excellent pattern recognition capabilities to characterise potential flaws. There is now no need for a raster scan as the array only has to move in a line parallel to the weld - helpful for manual inspections and significantly simplifying any mechanical handling system for automated inspections. However, the array must be sufficiently long to work with the maximum thickness of material and this may require a variety of different heads, which conflicts with the goal of achieving low cost. A technical problem with this configuration is the variation in propagation distance through the acoustic wedge for each beam. This can give rise to significant sensitivity variation along the array, which may be compensated by a beam dependent gain correction, but there may also be a bandwidth variation which is more difficult to correct. The wedge standoff adds significantly to the size of the array head and it is not always easy to control reverberation paths within the wedge. Figure 2d illustrates a variant of this approach, the transverse-scanned steered array, where the beam angle is generated by arranging differential electronic delays in the transmit and receive paths for each element. All beams now pass through a similar short distance in the acoustic standoff and so are well matched in amplitude and bandwidth. The electronic control is now more complicated and the constraints on the element design to achieve significant response at the desired angle become significant. It is well known that phased arrays have responses in unwanted directions (sidelobes and grating lobes) and these become more severe as the numbers of elements in the active aperture is reduced. The adverse geometry of the parallel-sided material will further enhance artifact echoes from the unwanted 0° beam. The configuration of Figure 2d can also be used with a 0° beam, either for flaw detection or in thickness gauging mode for corrosion detection. A position sensor, which measures the relative position orthogonal to the electronic scanning, can be used in conjunction with the known position of the beams to produce a map. Much of DSL's experience with linear arrays for NDT had been done to address particular inspection problems, such as rapid coverage of Carbon Fibre Composite (CFC) airframes. This work started at the end of the 1970s with medical imagers being modified for use with industrial arrays. 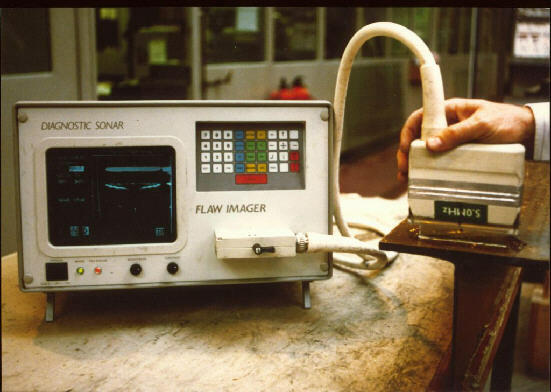 It was followed during the 1980s by a dedicated industrial version of the latest generation of portable medical B-scanners, the Flaw Imager. 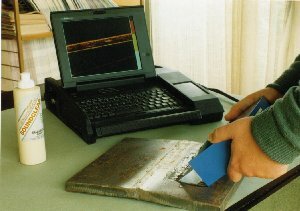 The start of the RAPINSPECT program in 1996 provided an opportunity to extend the technique to the rapid inspection of welds, as well as addressing some limitations of the original Flaw Imager, such as cost, size and ease of customising, for these applications. The rationale behind the design and the implementation of the integrated ultrasonic array for this application has been described elsewhere (Lines 1998). It could also be used for other applications and Figure 4 shows the head assembly for a 0° beam array, combined with a position sensor, which would be suitable for flaw or corrosion mapping. 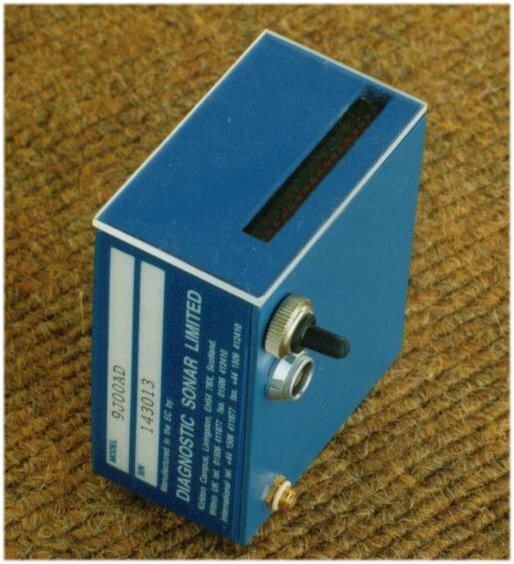 A high frequency variant, which can be used for ultrasonic spectroscopy as well as thickness mapping, has also been described (Lines, Dickson, Smith & Willsher 1999) and an early prototype can be seen in Figure 5a. DSL has implemented a number of other scanned array systems for use with piezo-ceramic or piezo-composite arrays (Willsher & Smith 1998). The element capacitance of these piezo materials is sufficiently high that a less complex and lower cost electronic architecture is possible and an example of the 16-beam array is shown in Figure 5b. A variety of other array configurations have also been tried, see Figure 5c, all of which use the same generic electronic interface and so can be used with both flaw detectors and imagers. The same arrangement can also be used for mounting the position sensor on these arrays. The solid axle of the position sensor constrains the movement of the array to a direction at right angles to the electronic scan. Push-buttons are provided on the position sensor module to allow the operator to start and stop the C-scan without taking hands off the array. The status of these buttons and the optical shaft encoders are read by a local electronic interface and passed on to the imager. The electronic control of the array head has been designed to be very flexible so that it can easily be adapted to a wide range of applications - from simple A-scan inspections with a flaw detector to sophisticated imaging and mapping systems. The same interface approach has been used for both the integrated piezo-polymer arrays and for the lower-cost piezo-ceramic and piezo-composite multiplexers. They can be operated with just a simple transmit-receive connection to the flaw detector, as with a conventional probe, or with a full bi-directional data bus capability for control of any of its functions. All array controllers are able to select the location of the beam and many are also able to control the number of elements (the aperture) for a given beam. The architecture of the integrated array is the most flexible and not only provides independent control of location and aperture for both transmit and receive, but is also designed to be allow control of the channel delays to each element for focusing and steering. In normal pulse-echo inspection, where the aim is to mimic a mechanical movement of a single element probe, the transmit and receive regions are coincident, but they can be set independently, so permitting a variety of pitch-catch combinations. For normal pulse-echo operation, the beam number defines the location of the centre of the transmit-receive aperture. Independent control of transmit and receive apertures means that the beam can be moved in steps of half the element pitch. For example, the 128mm 64-element integrated array has 128 beams positions on a 1mm pitch. The integrated array contains receive amplifiers in the head and so the receive signals have a high immunity to external environmental interference as well as being able to operate at long distances from the flaw detector. Indeed, the array will operate just as well with an oscilloscope, if there is no need for filtering or alarm gates. A small interface box, containing the power supplies and mode control, is all that is needed to operate the array with a conventional flaw detector, as shown in Figure 6. The alternative is to connect the array direct to a PC-based acquisition system. This arrangement is the preferred configuration for imaging applications as shown in Figures 6 and 7. The array transmission timing is usually derived from a trigger signal from the external instrument - typically the transmit pulse (or synchronizing signal) from the flaw detector. The trigger causes the integrated array to switch to the next beam location and the transmission occurs after an appropriate delay to allow for settling. The lower-cost multiplexers switch beam number at the end of the data acquisition period. RUN mode. The array head controller contains a beam counter that is incremented at each of the external triggers and so each transmission is from a different beam position. The beam position can be read via the data bus, allowing a B-scan or C-scan system to synchronize with the array scan. EXT mode. The beam position is now set by data loaded from an external controller. This mode allows external control of all the other internal parameters (beam location, aperture and beamformer profile for both transmit and receive) and it is even possible to do a software-controlled transmission. This is the preferred mode for imaging since the array is synchronized to the instrument rather than vice-versa. FIX mode. This is a subset of the EXT mode, for use with the flaw detector interface box. It allows the array to fire continuously from a fixed beam position, which is defined by use of thumb-wheel switches. This feature can be used once a scan has found a flaw, for localisation and characterisation by standard techniques. FRAME mode. This mode is used in conjunction with the double-buffered image acquisition system to achieve the data transfer rates for real-time B-scanning. Internal registers in the array head are loaded with the first and last beam numbers and the beam pitch of the scan. The first trigger acts like a frame sync and sets the beam number to the first in the frame and acquires an A-scan. Each subsequent trigger steps the beam number by the pitch value and acquires an A-scan. This procedure continues until the last beam number is scanned. The whole B-scan image data is therefore acquired without requiring software setting of the beam numbers. The system is sufficiently flexible to allow an image frame to be acquired from several interlaced image fields, similar to the scan line sequence of an interlaced television display. In this array case, it can be used to maintain a high pulse repetition rate but without compromising the data with echoes from an earlier transmission. Although the array can be used with conventional flaw detectors, the best results are obtained when the full potential of the array, to acquire a set of A-scans with known positional relationship, is exploited. This requires a customized data acquisition and display system but before discussing the requirements of such a system it is worth reviewing the limitations of the conventional flaw detector approach. 4.1 Limitations of conventional systems. Interfacing with analogue flaw detectors is uncomplicated, since the A-scan display invariably shows each transmission. When the array is in RUN mode, the A-scans from each part of the array are superimposed. Small sized flaws will only be displayed on a few lines out of the total in a sweep cycle and will therefore appear dim but visible, as illustrated in Figure 8. As long as the alarm is also updated on each line, then no flaws will be missed. The operation with digital flaw detectors is not so simple. The display is not updated on each transmission but usually at some significantly lower rate (typically 25-50Hz) and so will have a good chance of missing a small-sized flaw, as shown in Figure 9. Manufacturers rarely provide information on the display update in a way which allows operation with an array to be predicted, so trying out is the only guaranteed approach. Experience so far shows a display with rapidly changing A-scan - this cycles round at the beat frequency between the array frame rate and the display update rate. One possible solution is to trigger the array's sequencing from the flaw detector's display update, though this is a signal that is unlikely to be available as an external connection. The alarms on digital flaw detectors are still usually monitored every line and therefore flaw detection is still possible with these instruments, though caution is appropriate. Use of the array with thickness gauges is even less well defined since the manufacturer will almost certainly regard the pulsing and measurement timing as proprietary information. The imager must have a data acquisition sub-system which can handle the very rapid data rates associated with real-time B-scan images (typically 100x faster than needed for A-scans) but must also be able to avoid the frame rate beating problems above when displaying as A-scans. 4.2 Data acquisition and processing architecture. The prime constraint on any data acquisition and processing system is that it had to be capable of handling the data transfer rates that are several orders of magnitude higher than for a conventional A-scan display system. The array design had been chosen for the ease of customization and the same argument was used to select between the hardware and software options available. Designs for pulser-receivers with up to 20MHz capability are well understood. The aim was therefore to interface such a design to a digitizer and data processor that would be able to take data at the full sample rate and pulse repetition rates and derive the restricted data that was needed for the display. Even though a long display range might have been selected for a B-scan image, the rectified signals from a 5MHz transducer would still need to be sampled at around 50MHz to catch the shortest flaw echo. The job of the data processor is to derive the amplitude for each pixel in the final image, which might have come from over 100 samples for a long range, so that only this data has to be transferred to the display system. The task to be performed can be broken down into large numbers of very simple processes but which have to be done at great speed. These can easily be handled by digital signal processors (DSP) but it would need several in parallel to achieve the desired speed. There was also a requirement for the generation of the timing signals for the pulser-receiver and DSPs are not well-suited to these tasks. Application Specific Integrated Circuits (ASICs) could be used to achieve these tasks in parallel but they can be costly to develop and are not very flexible if the application requirements change. An alternative, which retains the flexibility of a programmable system but can process fast enough by implementing many of these processes in parallel, is a Field-Programmable Gate Array (FPGA). This was available off-the-shelf (from Virtual Computer Corporation) as a re-configurable co-processor card with a PCI bus interface for rapid data transfer. It was fitted with a standard PCI Mezzanine interface which could be used to interface directly to the pulser-receiver card. It also contained dual banks of fast RAM with separate access from the FPGA and the PCI bus. It could therefore be configured to have the FPGA processing and storing a new image into one bank of RAM, whilst the previous processed image was read out of the other bank and onto the display. The block diagram of the data acquisition and processing system is shown in Figure 10 and the details have been presented elsewhere (Darlington, Campbell & Lines 1997). The co-processor card is supplied with a full set of C++ routines for loading hardware designs into the FPGA (in the same way that one would load a software routine to implement a particular function) and for transferring data to and from both the FPGA and the image RAM. LabView® from National Instruments is a software package for developing virtual instruments within a Windows® environment. It has a special set of routines for imaging applications and these were confirmed to be fast enough for the real-time B-scan data rates when used with the twin banks of RAM. There are many advantages in using a 32 bit Windows® environment, including: availability of low cost hardware and development software; built-in storage and communications support allowing data and set-ups to be transferred between home base and the unit when in the field (even via the Internet); look-and-feel familiarity for rapid operator training. One of the disadvantages is that Windows® is not a real-time operating system. This problem is resolved by the ability of the FPGA processor to be handling the real-time events, with the data being transferred to the display when Windows® is ready to process it. This transfer can be done at a sufficiently rapid rate that there is no apparent lag and the whole system is effectively real-time. When the array is in RUN mode, and the imager is set to mimic a conventional flaw detector, the processor calculates the maximum and minimum amplitude value at each range over all the A-scans since the last display update. This use of the maximum avoids missing any flaw and the minimum allows standard loss-of-coupling techniques to be used. The imager can be set to do B-scans and here the array would be passed the beam start, stop and pitch values before being put into FRAME mode. The processor acquires the full frame into one bank of image RAM and then pauses. Whilst this has been happening, the previous image was being read from the other bank of RAM onto the display. When this is complete, the banks are swapped and the process re-starts. The maximum and minimum A-scans are derived over this same frame period and are also displayed on the screen. Figure 11 is an example of the screen display for such a mode when an unfocused 3.5MHz array is used to scan a weld test block with an arrangement of 1.5mm side-drilled holes over a range of 76mm. The B-scan image shows the drop in amplitude and resolution of the target echoes with range (the array position corresponding to the left hand axis). The A-scan display is set to show the maximum amplitude at each range and hence all targets even though not aligned under the same beam. Alternatively the A-scan trace could be shown for any selected line of the B-scan image. The other main imaging format is the C-scan. The A-scan display is used to set up the appropriate parameter (amplitude or thickness) for mapping and the image is then acquired - each line in the C-scan coming from a single sweep of the array. Software control using the EXT mode is fast enough if only one parameter is mapped, but there is an option for multiple parameter maps and here FRAME mode is used. 5.1. Results on a CFC bonded spar structure. The inspection of Carbon-Fibre Composite (CFC) structures used in modern aircraft is a good illustration of the advantages of the technique that have been described. The structures are safety-critical and so inspection techniques with guaranteed 100% coverage must be used. C-scan mapping not only ensures that this is achieved but also provides a permanent record that allows comparisons to be made with previous inspections. However there are large areas to be inspected and this means a significant downtime - something that is highly undesirable for both military and civilian aircraft. Exactly the same arguments apply in other fields such as the inspection of pipelines or pressure-vessels. Figure 12 shows the laptop-based Flaw Inspecta being used on a CFC test spar. A 5MHz 128-element piezo-composite array is mounted in the C-scan position-sensing trolley and C-scan images of thickness and amplitude are produced on the screen as the operator moves this transducer assembly along the spar. The system would normally be set up using the A-scan and real-time B-scan while the array is on a reference region or calibration block. The two buttons on the trolley then allow the operator to switch between the various scan modes without having to return to the main control panel, during the inspection operation. Figure 13 shows the results from the laptop-based Flaw Inspecta on the CFC test spar. This test piece comprises a standard outer-skin with a spar (tapered cross-section) bonded to the far surface. Four disbond flaws have been introduced between the skin and the spar - these being a combination of two flaw sizes at two different depths within the bond. The B-scan shows a frozen image of the cross section through one of the flaws. The flaw gate was set to capture any anomalies from just beyond the front wall of the CFC skin and extended to well within the bonded spar. The C-scans were recorded with the trolley being translated at a rate of 40mm/s and the resulting 64mm wide swathes show the features at a 1mm x 1mm resolution. There are separate C-scans of the peak amplitude within the gate and of the thickness (derived from the time-of-flight to this peak). The data from these two C-scans can be fused into a combined C-scan where the intensity represents the echo amplitude and the colour represents the thickness. The limitations of single-element ultrasonic transducers for inspecting large areas have been discussed and the advantages offered by arrays, for both manual and automated inspections, have been introduced. Arrays are widely used in medicine but only in niche applications for NDT. DSL has tried to resolve this by developing a range of integrated arrays that have a common interface and allow operation with many conventional flaw detectors and with minimal operator training. However, the best results are achieved with a real-time imaging system that is capable of A-, B- and C-scans. The requirements of such a system and how it can be implemented in practice has been presented along with examples. The arrays and imagers are currently being evaluated for a variety of applications including weld inspection, flaw detection and mapping for aircraft and in corrosion detection and mapping for offshore inspections. These are already showing considerable promise and further work will continue with the development of the arrays and of the imager system on other applications. The author can be contacted at Diagnostic Sonar Ltd., Baird Road, Livingston, Scotland, EH54 7BX. Tel: +44 1506 411877. Fax: +44 1506 412410. Website:http://www.diagnosticsonar.com. E-mail:dave@diagnosticsonar.com. The author would like to acknowledge the European Union funding for the RAPINSPECT program. End-user views are vital and comments from the RAPINSPECT partners (for weld inspection) and from DERA, BAE Systems and Airbus (for the Aerospace applications) have been much appreciated. Bennett, J.T. 1995. "Development of a finite element modelling system for piezo-composite transducers". Ph.D. Dissertation. Glasgow: University of Strathclyde. Darlington, D.J., Campbell, D.R. & Lines, D.I.A. 1997. "Reconfigurable FPGAs for data compression in ultrasonic non-destructive testing" IEE Colloquium on "DSP Chips in Real Time measurement and Control", University of Leicester, 25th September 1997. Drinkwater, B. & Cawley, P. 1994. "An ultrasonic wheel probe alternative to liquid coupling". INSIGHT Vol36 No6: 430-433. Krautkramer, J. & Krautkramer, H. 1983. "Ultrasonic Testing of Materials". Berlin: Springer-Verlag. Lines, D.I.A. 1998. "Rapid inspection using integrated ultrasonic arrays". INSIGHT Vol40 No8: 573-577. Lines, D.I.A, Dickson, K.R. & Filippi G. 1999. "Rapid manual inspection and mapping using integrated ultrasonic arrays" Proceedings of 2nd International Conference on "Emerging Technologies in NDT", Athens, 24-26 May 1999, (ISBN No: 90 5809 127 9), pp.97-105. Lines, D.I.A, Dickson, K.R., Filippi G. & Moir, T.J. 1999. "A real-time image acquisition and processing system for ultrasonic arrays in NDT" Proceedings of NDT'99 and Corrosion'99, Poole, Dorset, 14-16 September 1999, (ISBN No: 0 903132 27 3), pp.11-17. Lines, D.I.A, Dickson, K.R., Smith, R.A. & Willsher, S.J. 1999. "Optimisation of High-Frequency Array Technology for Lap-Joint Inspection" Proceedings of NDT'99 and Corrosion'99, Poole, Dorset, 14-16 September 1999, (ISBN No: 0 903132 27 3), pp.263-269. Lines, D.I.A, Dickson, K.R., Smith, R.A. & Willsher, S.J. 1999. "Optimisation of High-Frequency Array Technology for Lap-Joint Inspection" Proceedings of 3rd Joint FAA/DoD/NASA Conference on Aging Aircraft, Albuquerque, 20-23 September 1999 (see http://www.galaxyscientific.com/agingaircraft/pdfs/6c/6c3d.pdf). Reynolds, P. & Hayward, G. 1998. "Design and construction of a new generation of flexible ultrasonic transducer arrays". INSIGHT Vol40 No2: 101-106. Willsher, S.J. & Smith, R.A. 1998. "Multi-element ultrasonic scanning of in-service airframes". INSIGHT Vol40 No3: 154-159.